As a cold snap grips the country, and heating bills come in, the allure of passive houses becomes clearer. Snug, efficient passive houses warm our thoughts. With the end of the year approaching we look back and tally up our triumphs. This year saw great leaps for the passive house standard, and Passive House Northwest. Our Spring conference, "Building Carbon Zero" was a huge success. We had vendors from all over the region showing off their new techniques and technologies. Speakers provided several informative and interesting presentations (which you can view on our website). We had so many great sponsors excited to participate in our conference and support the passive house standard. What an event! Passive House Northwest was also honored to produce our first Fall conference in beautiful Spokane. This was our first event east of the Cascades and the response was awesome. We were able to offer a discount to non-members and introduce some people to the passive house standard. These events were successful, our year was successful, because of our membership. Knowing that there are so many people out there, dedicated to elevating the idea of what a building could and should be, keeps our organization going. Please join us for another great year of Passive House Northwest! The eigth annual Passive House Northwest conference and tradeshow will be held April 6-7 in Olympia, WA. The submittal deadline is Monday, January 16, 2017. Presenters will receive discounted registration for the conference. Because Passivhaus understands that the building itself-its skeleton and skin­-is technology, it too is part of this disruption and can help accelerate our transition to a post-carbon world. Just as innovation in PV technology improves performance, innovation in Passivhaus design and construction drives down energy consumption and building cost, opening the real potential for market transformation in the building sector. Read Zack Semke's report, "On Buildings, Swans, and the Power of Arithmetic," to learn more. "We are writing in support of the proposed changes to the Green Buildings Policy for Rezonings as a key step in implementing the city's ambitious Zero Emissions Building Plan. This policy will enable a new generation of high-quality buildings that are low emissions. The policy prescribes a simple approach that focuses on the building envelope -- an airtight design, super insulation and good ventilation." Follow the link below to view the entire letter to Vancouver Mayor. Wolfgang Feist built his Passive House twenty-five years ago, and he and his family have been living there ever since. A year ago, he and his wife Witta Ebel added a solar array to the home to bring it to net positive energy performance and to target the new Passive House Plus certification offered by Passivhaus Institut. Passivhaus Institut announced the home's Passive House Plus certification on November 30. In September the Pembina Institute, a Canadian-based non-partisan think-tank that advocates for strong, effective policies to support Canada's clean energy transition, published a significant report identifying the current state of the market for passive buildings in North America. The authors see rapid growth in this sector and hope that the lessons learned can inspire other policy makers to further increase energy efficiency in buildings. The report has since been widely shared and promoted. It is great news to have an independent and respected entity attest to our market success. Thank you to the authors for their diligent work and of course thanks to you -- the passive building professionals -- who make it all happen! This report comes on the heels of another policy first in North America: in August of this year Massachusetts included the PHIUS+ 2015 Passive Building Standard as a qualification path to comply with the base energy building code for residential and commercial construction! On April 28 and 29, 2017 Passive House practitioners from around the world will convene in Vienna to explore the theme, "Passive House For All," including diverse project types (from kindergartens to retirement homes) as well as diverse construction methods and energy systems. Learn more at the conference website. If you are a Certified Passive House Consultant (CPHC®) and want to brush up on your passive building knowledge, or if you previously took the CPHC training and are preparing for the certification exam, the new online CPHC Refresher Course is a great way to get up to speed with the curriculum's latest knowledge and tools. Next spring we will be launching a streamlined online platform for the virtual phase one of the CPHC training program. Stay tuned for more information and details on how you can register. This is the second phase of CPHC training following the online portion; both Phase 1 and 2 are required in order to successfully complete the course. Phase 2 is five days of in-class instruction to be held from the end of March through May of 2017 in multiple cities in the US and Canada. Stay tuned for more information and specifics on upcoming in-class locations and dates. Since 2013, WUFI Passive has been integrated into the PHIUS CPHC training program. However, if you took the training prior to 2012 or simply wish to polish up on your modeling skills, this workshops will get you up to speed with this terrific tool. This intensive two-day in-class instruction session allows attendees to learn the WUFI Passive software in a hands-on setting from our expert trainer Prudence Ferreira of PassivScience. Spots are limited, so register today! 425 Grand Concourse, a new passive building project going up in the Bronx's Mott Haven neighborhood, is targeting certification under the PHIUS+ 2015 Passive Building Standard. The mixed use project is slated to include 241 units of affordable housing apartments in addition to a supermarket, charter school, medical facility, cultural and community spaces, and social services facility. With support from the Department of Housing Preservation and Development (HPD) and the New York City Housing Development Corp. (HDC), the development of this city-owned parcel will be financed under mayor Bill de Blasio's Housing New York: A Five-Borough, Ten-Year Plan. The 24-story building is expected to be the largest residential passive building in New York City once completed and will use 70% less energy than conventional buildings. It also is expected to surpass Enterprise Green Communities guidelines, with energy-recovery systems, solar-shading devices, and water-savings features. Each unit will include individual energy controls and energy-efficient appliances. More information on the project is available here. 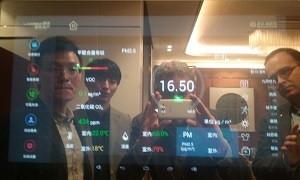 In part two of the two-post blog series on her recent trip to China as keynote for the Passive House Alliance China's 3rd China Passive Building Summit in Shanghai, Katrin Klingenberg reports on the great progress being made in the country to bring passive building mainstream. Katrin discusses how In a mixed/humid climate like Shanghai, the most important challenges for passive design space conditioning solutions in these cities are not the thermal loads - it's the humidity! And in a place like China, where flavorful and spiced foods play a major role in the lifestyle and culture, this presents an additional layer of challenges for exhaust and space conditioning as well. Read the full post on The Klingenblog, and be sure to subscribe here to be notified of all updates. Beach Green Dunes, a brand new passive building project Pre-Certified under the PHIUS+ 2015 Passive Building Standard, is taking shape in the Rockaways, Queens on Long Island. The project is part of the Edgemere neighborhood's Resilient Edgemere Community Planning Initiative to build resilient housing for area residents. The project, a partnership between the Bluestone Organization and Triangle Equities, cost a total of $32.5 million and will be one of the largest passive building projects in the country once completed. The seven-story, 94,000-square-foot structure includes studios, one, two, and three bedrooms for individuals earning 50, 60, and 90 percent less than the area media income. According to architects Curtis + Ginsberg, it was "designed to withstand the severe weather conditions of the Rockaways, while incorporating many energy-efficient features." More information on the project is available here. The Verdant Group Consulting is seeking qualified independent contractors to provide professional research, technical writing and review to produce case studies and policy profiles for the Northwest EcoBuilding Guild's Code Innovations Database over a 9-month period, on a variety of topics in high-performance green building design, materials and technology. Please see the full RFP here. More information about the Code Innovations Database can be found here.